Let's take a walk back in time and learn about the colonists who came to America voluntarily for different reasons. This collection of Colonial America worksheets, maps and charts for students of grade 5 through grade 8 help teach an assortment of skills through activities such as locate, label and color the 13 colonies and colonial regions on a map, compare the American colonies, name their capitals, match the colonies to the founders, learn about the colonial American jobs and many such; to address the thinking abilities of children. The ability to read a map is a skill that must be learned and requires considerable time and effort. This map vividly displays the geographical regions of the 13 colonies along with their names and colonial divisions. 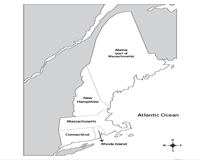 Best known as the destination for Puritan religious reformers the New England Colonies comprise New Hampshire, Massachusetts, Connecticut and Rhode Island. This map shows the four colonies marked clearly. 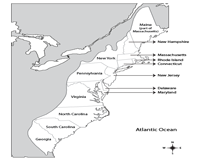 Visualize the location of the Middle Colonies in relation to one another. Quite literally this map helps children figure out the Middle Colonies of Pennsylvania, New York, New Jersey, and Delaware that were created to be more religiously tolerant. 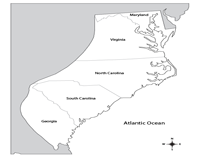 Maryland, Virginia, Georgia, North and South Carolina became the historical core of the Southern United States. Figure out the location of each colony and develop map skills and insist on comprehending, rather than just observing the map. Put comprehension skills to test and divide the thirteen original colonies into three colonial regions, identify the New England, Middle and Southern Colonies and color them using the color key. Build children’s spatial reasoning skills and help them locate the thirteen colonies and label them using the names from the word box in this printable geography map activity worksheet. Bolster map skills and recapitulate the names of the thirteen British Colonies of America with this locate and label activity. Direct 6th grade children to identify each colony and name it. Recognize the three colonial divisions as well. 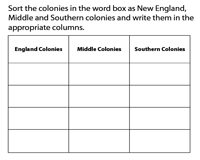 Categorize the thirteen colonies in the word box based on the location as New England, Middle and Southern Colonies and write them in the appropriate columns. Grouping the colonies help learn their similarities. The goal here is to help children recall from memory the capital of each colony. A list of capitals is provided in the word box. 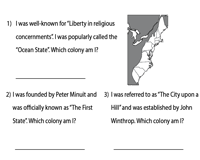 Read the names of the colonies, pick their capitals from the word box and write them beside the colony to complete the worksheet. An extremely competitive economic philosophy pushed European nations to acquire as many colonies as they could in America. Get children to research a little more about each colony and know who founded the colony and match the colony to its founder. 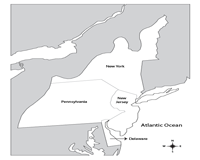 A pattern of jobs and industries emerged in colonial America according to the different regions. 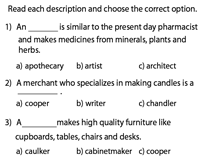 Read the descriptions and choose the occupation in this MCQ worksheet and learn about the jobs in the colonies. 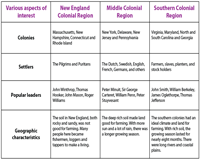 Equip students with this chart that helps compare the colonies and find out how they differ from each other in terms of climate, religion, occupation, reasons for settlement, form of government and more. This grade 7 and 8 worksheet features questions based on the comparison chart. Analyze the distinguishing features of the three colonial regions and answer the questions. Serves best in testing comprehension. 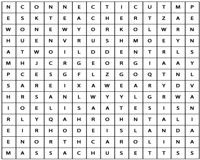 Hidden in this 14 x 14 word search grid are the names of the thirteen colonies. Let the explorers look for the names of the colonies letter by letter, horizontally and vertically and hone their spelling skills in the process. Put on your thinking caps and get ready to solve the colonial America riddles. 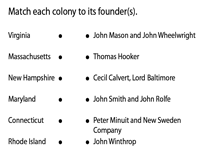 Read the descriptions and guess the name of the colony and reiterate a few facts about each of the 13 colonies.